Barry Bonds is one of those players that sharply divides baseball fans. There is little doubt that he is one of the greatest sluggers that the game has ever produced. His stats are mind-boggling and even Hank Aaron has endorsed Bonds as his official heir to the all-time home run throne. However, there are those who point out that Bonds is in the middle of a court case. The fact remains, Bonds holds the record for All time Home Runs and most home runs in a single season. Regardless of what anyone thinks about Bonds as a person, there is no doubt that the man can hit the ball out of the park. He has 762 home runs, earning him the all-time career home run title. 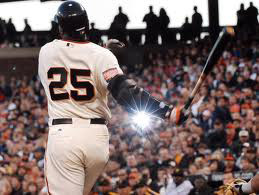 Bonds also has 2,935 hits and 1,996 RBI. He also has 514 stolen bases, proving that he was a threat even without a bat in his hand. Like a lot of powerful home run hitters, he also amassed a huge amount of walks including 2,558 overall and of those, 688 were intentional. Alex Rodriquez is the only player close enough to surpass Bonds Home Run record needing 118 Home Runs to tie the mark. Bonds was no stranger to the All Star Game. He was elected to represent his team a whopping 14 times. He played in the Home Run Derby in 1992 when the event was at Jack Murphy Stadium in San Diego. Bonds was back in the Home Run Derby in 1993 when the event was at Camden Yards in Baltimore. Juan Gonzalez won that year with seven homers. Bonds gave him a run for his money with five homers. Bonds would finally have his day at the plate during the Home Run Derby in 1996. This time the place was Veterans Stadium in Philadelphia, the home of the Phillies. Bonds was, of course, representing the San Francisco Giants. He was facing off against some of the biggest hitters in the majors including Mark McGwire, Jeff Bagwell, Ellis Burks, Gary Sheffield and more. It was a close match-up, particularly between Bonds and Mark McGwire, but Bonds would end up with the championship. Bonds would eventually end up with a number of records. He would break the single-season home run record, once again beating Mark McGwire’s record. He would also break the record many felt could never be broken when he hit more than 700 home runs for his entire career, and break Hank Aaron’s previous record. Those kind of records and impressive numbers have definitely earned Bonds entry into the 500 Club. However, it may not be enough to get him into the Baseball Hall of Fame in Cooperstown. That’s because, despite those impressive numbers, Bonds has been embroiled in steroid and performance-enhancing drug controversies for years. 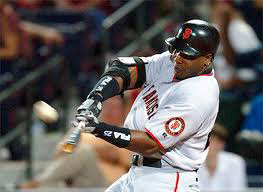 Bonds was even investigated and questioned by the federal government when they looked into the steroid usage in the game during the early 2000s. He was later accused of lying about not taking the drugs, which led to a perjury investigation and that ended up in a conviction on obstruction of justice charges in 2011. Since then, Bonds has remained largely out of the spotlight. Despite this, there are those in the game who have endorsed what Bonds has done. For example, Hank Aaron, whose all-time career record was broken by Bonds, has endorsed Bonds and thrown his support behind the controversial player. For many fans, Bonds is one of the greatest players that has ever held a bat and they discard the accusations against him for the drug use. For some fans however, Barry Bonds has been so surrounded by controversy and accusations that his accomplishments may forever be tarnished.